This disc finds the Tokyo Quartet at the very top of their game. As in their recent recording of the late Beethoven quartets, this is an interpretation that completely reinvents a favourite from the core repertoire. Schubert's C Major Quintet is given an opulent and expansive reading. It is the kind of slow and majestic performance that most ensembles would shy away from as the long arching phrases would highlight problems in their ensemble and tuning. But the Tokyo players are rightly confident in their own technical abilities, and this allows them to give the work an almost symphonic dimension. Those slow tempos may prove controversial. They certainly create some structural issues that a brisker reading could gloss over. In particular, the fact that Schubert only ever gives the briefest of transitions between the sections means that there are often abrupt gear changes, between the slow introduction to the first movement and the exposition proper, from the famous main theme of the slow movement into its faster middle section, and the other way round in the scherzo. But the players treat those abrupt changes more as a virtue to exploit than a problem to resolve, and the sheer conviction and precision with which each is executed means that they always convince. And the fabulous pay-off is the heightened atmosphere that the ensemble achieves in the slower passages. The opening gives a taste of what is to come. The depth of tone here is just wonderful, even in the quiet dynamic. Harmonia Mundi USA excel themselves in the quality of the SACD audio (the recording was made at George Martin's Air Studios), giving a wide and even response across the entire frequency range. 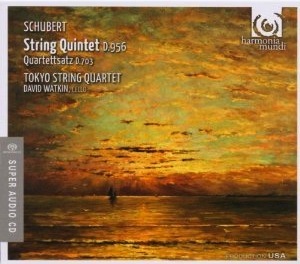 And cellist David Watkin fits seamlessly into the Tokyo Quartet sound, bolstering those noble bass lines and giving the microphones something to focus on in the lowest register. The main theme of the adagio is given the slowest reading I've ever heard, but the continuity of the phrasing and evenness of the tone means that the music never flags. When this main theme is recapitulated at the end of the movement, the group gives a surprising emphasis to the added obbligato lines from the violin and cello, so much so that the main theme is hardly recognisable. Like the slow tempos, this is a brave and dangerous strategy, but again the conviction and precision of the performance means that the music's integrity is never at risk. Given that the Tokyo Quartet's greatest strength is the atmosphere and intensity they bring to the slower passages, it is gratifying that the fast music is just as successful. Take, for example, the main theme of the first movement. The way that it launches out of the music of the slow introduction is ideal. Here too, the tempos are slightly slower than you might hear elsewhere, but there is plenty momentum behind the theme, which is never threatened by the unusually robust harmonies beneath. The coupling is the unfinished Quartet in C minor, one of the many gems of Schubert's extensive catalogue that is not heard or recorded half as often as it should be. The completed first movement is surprisingly similar in its harmonies and melodic contours to that of the Unfinished Symphony, a comparison that is emphasised by the symphonic depth of the Tokyo Quartet sound. The composition trails off half way through the second movement, and rather like recordings of The Art of Fugue or Mahler's Piano Quartet, the ensemble chooses to play what the composer wrote and to simply tail off with the music as the staves become progressively whiter. It feels like a poignant and premature farewell, and the emotional power of this abortive conclusion, indeed the emotional power of both works on the disc, is heightened by the quartet's rigorous approach and resistance to sentimentality. These may be slow, expansive readings, but it is the discipline and accuracy behind them that gives them their extraordinary power. 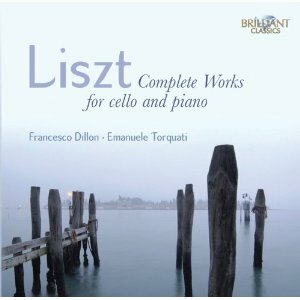 Liszt's original works for cello and piano are few, but all are well worth hearing. The five pieces date from 1874 to 1883, towards the end of the composer's life, when he had long given up his soloist career and had turned instead to more spiritual pursuits in his adopted home of Weimar. As a result the music has a profound spiritual quality. Much of it sounds difficult, although it is rarely overtly virtuosic. Structurally and harmonically, each of these short pieces is very adventurous. There is little in the way of traditional form, and they rely instead on a kind of Tristanesque stream of continuous melody. And none of them ends conclusively, with Liszt opting instead to drift off into infinity by one means or another each time. The longest and most significant of these works is the fourth, La lugubre gondola. This is one of those frustrating cases in musical history when the chronology doesn't quite fit the mythology. Both the title and the musical style suggest the piece was written as a memorial to Wagner, who died in Venice. But in fact the work was written shortly before Wagner's death, leading to some poetic suggestions from Liszt himself about the work being a premonition. That apart, the piece is classic Liszt. It is the longest piece on the disc, but despite its fairly slim musical materiel it doesn't outstay its welcome. And it is the ideal vehicle for Francesco Dillon's expressive but precise technique. In fact, all the performances here are excellent. The two players coordinate the music skilfully, with ideal balance and ensemble. Francesco Dillon has a tone that veers between the woody and the lyrical as the music requires. He is generous with the dynamics, although not to a fault, and Emanuele Torquati balances him well in both the quiet and the loud passages. The recording quality is also good, giving a real sense of proximity to the players but also managing some space in the acoustical environment too. The other works on the disc are all arrangements by other hands of piano pieces, but all remain thoroughly Lisztian. It turns out that two of the original works for cello and piano are arrangements by Liszt of his songs anyway. Stylistically, the common thread is Liszt's long, flowing melodies, all of which work beautifully on the cello. We hear five of the Consolations, which do sound a little lighter of texture for having the melody removed from the piano part. It would be difficult to imagine Liszt himself endorsing piano parts with so few notes. But the cello remains the focus of attention, and the sheer beauty of the solo playing is more than enough to keep the listener engaged. Angelus from the third book of Annees de Plerinages continues the meditative tone of the previous works. The long phrases and note values here make greater demands on Dillon's bowing technique, but it is never found wanting. Liebestraum No.3 seems like a bit of a populist lollipop to fill the programme up at the end. But it too is very much in the spirit and the mood of the previous works, so why not? 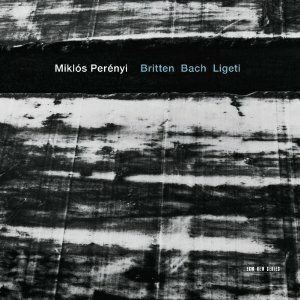 This new solo disc from Miklós Perényi comes hard on the heels of a very similar offering on the Wigmore Live label. In both cases, Perényi bases his programme on works by Britten and Bach, composers with whom he clearly has a deep affinity. They also invoke the spirits of two the previous generation's greatest cellists, Rostopovich in the Britten and Casals, Perényi's teacher, in the Bach. In fact Perényi shares many of their qualities. He has the spirited, energetic sound of Casals, but he also has the dark tone and disciplined approach of Rostropovich. Britten's Third Suite often sounds as if the composer is thinking about the Bach Suites and trying, but failing, to avoid their rhetoric. Perényi makes all the stylistic connections clear, especially the passages where the music breaks into wide arpeggios across the strings, and we are constantly reminded where those sorts of textures originated. But Perényi treats the Suite as a masterwork, giving a committed and focussed account of every single phrase. This is particularly valuable when Britten writes simple but strident melodies, which have little to offer beyond the beauty of the player's tone. We get that in spades, allowing Perényi to maintain the musical interest even when the composer's inspiration flags. Given that Perényi studied under Casals, the cellist who rediscovered the Bach Suites, comparisons between their performances seem inevitable. Like Casals, Perényi has a very tactile approach to the music, and the excellent recording quality allows us to hear up-close the minute variations in the sound of the bow against the string. On the other hand, he never indulges in the extremes of rubato for which Casals was known. Not that his playing is rigid either, but it is certainly more conventional as far as tempos go. Like the Britten, this is a very serious and deeply-felt performance. That helps to make the listening experience all the more involving and also adds to the drama in the louder passages. But many of the movements here cry out for a lighter approach. Bach expects the bow to bounce between the strings, and the fast tempi to be articulated with shorter and more detached notes. But that's just not the way Perényi does things. His interpretation is wonderfully coherent and personal, but at times his sheer seriousness can drag it down. Ligeti's early Sonata for solo cello might also benefit from a slightly lighter approach. But again, Perényi delivers an interpretation of such conviction that you can't help but appreciate it on its own terms. Stylistically, there is nothing to scare the horses here; it is very much Ligeti in Bartók mode, with some Hungarian folk music inflections and a few glissandos thrown in for good measure. It is a substantial piece though, and far more than just a novelty encore. The recording quality is of the high standard you'd expect from ECM. The acoustic is resonant and warm, but all the details are there too. The packaging is elegant, of course, but the thick liner is mostly given over to a rambling and abstract essay from Paul Griffiths, who can usually be relied on to produce something more readable. That apart, this is an excellent release, equal in quality to Perényi's Wigmore recital disc, but recorded in an environment that gives it a completely different atmosphere. Even in his advancing years he remains one of the greatest living cellists, so any more solo discs he might care to record would certainly be most welcome. Music for brass and percussion inspired by the vibrant country and people of Spain. London's orchestral and session brass players well deserve their reputation as among the best in the world, but the chances they get to show off their skills are all too rare. Roger Argente, bass trombonist with the Royal Philharmonic, is putting this to rights with his new group – Superbrass. 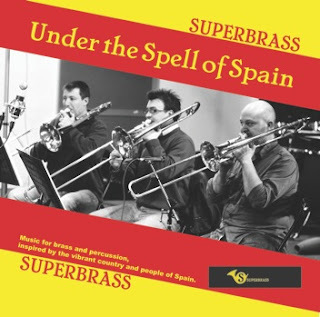 "Under the Spell of Spain" is their debut album, featuring an impressively diverse programme of new works and arrangements inspired by the country. The project is similar in spirit to the London Trumpet Sound and London Trombone Sound albums of yesteryear. They too were designed to show off the skills of London's session brass players. The big difference though is the originality of the material here. There are no songs from the shows and no jazz standards. Instead, the programme moves between arrangements of renaissance Spanish music and jazzy numbers written for the occasion. Renaissance ensembles and big bands are, of course, familiar territories for most brass players, and the stylistic sympathy that these players bring to every number is ideal. And don't worry if you think the early music might be a bit dry for your taste, the arrangers always add in thoroughly modern twists to keep both listeners and players on their toes. The more modern music often looks to Latin America, expanding the Spanish theme to include salsa and tango. Given the quality of the results, it seems churlish to complain on a geographical technicality. And, as if to anticipate such concerns, at least one of the composers writing on a South American theme, Steve Waterman with "Fugatango", adds in some castanets for Spanish colour. Fortunately though, none of the arrangers go overboard on the castanets, and on the few occasions they do appear, they are admirably restrained. That said, the brass players are accompanied by a considerable percussion section. Listening to the opening track "Como poden per sas Culpas" arranged by Jock McKenzie, which is a kind of Spanish "Fanfare for the Common Man", you could be forgiven for expecting a percussion-heavy programme, but the focus soon moves to the brass and stays there. Although all the playing is to the highest standard, one or two performers really stand out. There's a kind of battle of the soprano trumpets between Brian Thompson in "Dindirindin" and Philip Cobb in "Air des Espagnoles". If the latter comes off best, that's probably just because he has more notes. Then there is some fabulously understated trombone playing from Andy Wood in Mark Bassey's "Donde el Mar Saluda el Cielo". A mention should also go to Kevin Morgan, the ensemble's only tubist, who for some reason is denied a solo, but who underpins all the textures admirably. Given many orchestras' preference these days to record live, the studio album is becoming more of a rarity. But this disc is very much a celebration of what can be achieved under studio conditions. So we have ideal balance (for which the players themselves deserve a share of the credit) and an ideal stereo array. There is no sense of the atmosphere of a live event of course, and the reverb that many of the textures rely on is clearly digital. But bar some small grumbles about the track listings, this is an excellent disc. The Spanish theme is a great way to keep the diverse programme coherent, the arrangements all sound fresh, and the playing is beyond reproach. Roger Argente says in his introduction that the project has been influenced by the late, great Philip Jones Brass Ensemble. Well, Superbrass have shown themselves to be worthy successors to that group. Here's hoping their future recording output will be similarly extensive. 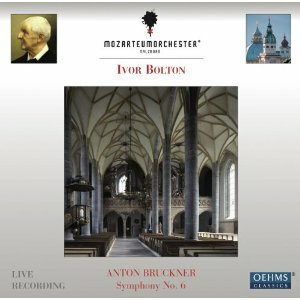 Ivor Bolton's approach doesn't suit every Bruckner symphony, but he has some valuable and rare insights to offer on the Sixth. Previous instalments in this cycle have lacked weight and dramatic integrity. This Sixth is clearly in the same mould, but the benefits outweigh the losses, especially in the details he brings out from the score, which dozens of conductors before him have either overlooked or sacrificed for the unity of the whole. The Mozarteumorchester Salzburg lives up its their name. If it weren't for the photograph of what is clearly a full size orchestra in the liner, I would have sworn that this was a chamber ensemble, albeit a large-ish one. The strings in particular seem to be lacking a few desks in each section. But if that is an illusion, it is a result of the chamber-like playing from the strings. They never go for big full-bow sounds, opting instead for clear and precise textures, and creating contrast though variety of articulation rather than extreme dynamic contrasts. And the Austrian character of the string playing is evident throughout, especially in the earthy, rustic sounds of the slow movement and scherzo. The woodwind and brass follow suit. There is some wonderfully distinctive playing from the woodwind soloists, especially the oboe, who is heavy on the vibrato, but not to a fault. And the brass playing is just excellent. Bolton never asks them to go overboard on the climaxes, enabling them to maintain a fine tone throughout. The ensemble within the trumpet and horn sections is ideal. And as with the strings, the range of articulations, especially from the horn and trumpet soloists is a revelation. The more modest dynamics from the strings allow a good number of wind counterpoints to come through that you may never have heard before. Bolton makes a point of faithfully reproducing all the articulations in the score. That often means that phases are shaped more through the variety of attack on the various notes than through dynamics or rubato. The rubato is perhaps a little too literal; tempo changes are given as specified in the score, but rubato for phrasing is much more subtle. Bolton compensates for the lack of weight in the orchestra's sound with some expansive tempos, especially in the first two movements. That is a risky strategy but it pays off, returning a sense of grandeur to the music. And he is not afraid to drive the finale on when required. The last five minutes succeed primarily because of the increase in tempo and energy he injects. But for all that, the lack of weight in the orchestral sound remains a problem. There are a number of places were the music comes to a halt and after the brief caesura the full string section enters with a large, warm chord. Bolton tries to make the coming entry more spectacular by drawing out the pause, but the thin sound from the strings, when it comes, is usually a disappointment. Otherwise this is an excellent recording. The focus on detail really justifies many of Bruckner's compositional decisions. More grandiose recordings make the work out to be more like the monumental Eighth or Ninth. It is always going to suffer by comparison to them, so in many ways Bolton's approach – to treat the often delicate textures with more care and attention – better represents its more modest aspirations. 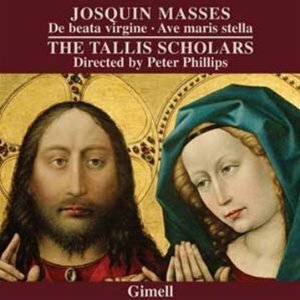 The Tallis Scholars' ongoing, if sporadic, series of Josquin Masses has been a treat for fans of both the ensemble and the composer. Like Tallis, Josquin is a composer prone to dryness in performance. There are elegant textures and harmonies, but there is always a risk that by concentrating on the complexities of the counterpoint these moments of beauty will be passed by. Not so here. The elegance of the sound is second to none. Yet the choir is small and the performance practice - tempos, rubato, tone etc. - is as strict as any. The two masses are very different works. Missa De beata virgine was apparently the most popular of Josquin's masses during his lifetime, which comes as a surprise, not so much for a lack of quality as for a lack of coherence and identity. The separate movements are each based on different, and musically unrelated, Marian chants, and while the Kyrie and Gloria are in four parts, the rest of the mass is in five. The contrapuntal techniques are also unusually complex, even for Josquin. Missa Ave maris stella is more typical of the composer. It is based on a single chant, and its textures are both simpler and more varied in their density. If anything, the contrast between the two works has the effect of highlighting the unusual construction and sound of the former. But both are mature Josquin. Stylistic features suggest Ave maris stella is the earlier of the two, but both are up to the high standards of contrapuntal flow and ingenuity for which he was rightly famous. Between the two masses is the so-called Cambrai Credo. This is quite an extrovert setting, with often dense contrapuntal textures. But it bridges the stylistic gap between the two masses well, as complex as the former, yet as accessible as the latter. The Tallis Scholars sing two to a part, which sounds just about ideal for this music. The alto lines are taken by one female and one male singer, which if anything adds richness to the sound rather making it seem like a compromise. The long-running debate about singing this music at the written pitch or a fourth higher seems to have been settled conclusively in the case of De beata virgine by the low tessitura of the music, especially in the Credo, which requires transposition to be performable by anybody. The acoustic of Merton College Chapel is surprisingly dry, but not detrimentally so. The singers are able to generate sufficient warmth through their combined tone colour not to require further atmosphere from a resonant acoustic. Josquin's music is well served on this recording, which is at least as interesting and satisfying as any of the previous releases in the series. De beata virgine is particularly interesting, given its stylistic distance from the rest of the cycle, and the curious fact that it was so popular in its day, despite (or perhaps because of) its musical complexities. Anybody with the technology and inclination to download this or any of the Tallis Scholars' other recent releases may be interested to know that they are available on the group's website (www.gimell.com) in a wide range of formats and file sizes. The largest is 24 bit, 96 kHz 5.1 surround. If the sound quality on this CD is anything to go by, that high res version promises to be a very satisfying listening experience indeed. 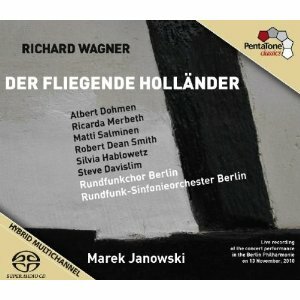 Marek Janowski's Wagner cycle on PentaTone gets off to an excellent start with this Flying Dutchman. All ten of Wagner's mature operas and musicdramas will be appearing between now and 2013, the composer's bicentenary, and if they're all as good as this, it promises to be an exceptional recording project. Janowski has said that he now conducts Wagner exclusively in the concert hall, having abandoned staged opera in protest at the excesses of his erstwhile regietheater colleagues. His view that Wagner's vision for his music can be preserved through concert performance is endorsed in the liner (or rather hardback book format packaging) by no less a figure than Norman Larmmert, president of the Bundestag. He even goes as far as to say that Wagner would have approved. I'm sceptical of that. Extracting the music from the other dimensions of a staged production is hardly in the spirit of gesamtkunstwerk. Nevertheless, it is increasingly becoming the norm in the record industry, and this Dutchman is just the latest in a string of Wagner operas on CD/SACD taken from live concert performances. In general the quality bears out the approach. Elder's continuing Ring cycle with the Halle, and the two recent Parsifals from Gergiev and Zweden have demonstrated that a good live concert performance can be an ideal subject for a high quality recording, and this PentaTone release is at least to the standard of any of those. Part of Janowski's justification seems to be that the music itself contains enough of the drama to compensate for the lack of staging. He practises what he preaches, and delivers a wonderfully dramatic reading. But that is only one of the many qualities of this performance, and the drama is always matched and balanced by control of the textures and immaculate preparation. The main difference between this reading and most of its competitors on the market is that Janowski never lets the music, and the storm music in particular, overwhelm. There is always detail and balance to the sound, and the separate sections of the orchestra are always clearly defined. The sheer quality of the SACD audio is enough to recommend the release. The recording team do, of course, have the benefit of the excellent acoustic at the Philharmonie in Berlin. Not only is this clear and vibrant, but it is also impressively unobtrusive. van Zwedens Parsifal, in comparison, excellent as the audio is there, is obviously a concert performance because of the distinctively resonant acoustic of the Concertgebouw. The Philharmonie, in contrast, could pass for a good opera house acoustic, adding credibility to the results. The casting is excellent, and most of the names are familiar from Wagner performances at the world's top house, so probably don't need much introduction. Matti Salminen is the Daland of today, and gives a reading that has both weight and humanity. Albert Dohmen is similarly weighty, but more ethereal and emotionally distant. This has the valuable effect of distinguishing the two low voices in their various scenes together. Ricarda Merbeth puts on quite a lot of vibrato as Senta, but it is always carefully controlled and works to the benefit of her tone. She has a valuable alto-like richness to her lower register that Wagner occasionally employs. Robert Dean Smith, although rapidly becoming the Heldentenor of his generation, gives a more bel canto performance as Erik. His tone is surprisingly light and floating, which contrasts well with the predominantly heavier voices in the rest of the cast. The only slightly weak link is Steve Davislim as the Steuermann. His is the only voice that risks being subsumed by the orchestra, and his tone is occasionally unstable. But the recording team ensure that he is always at the front of the sound, so nothing is lost. The delicacy and detail of much of this music-making is the greatest surprise on this recording. Janowski locates the music decisively in the early 1840s, and makes all those connections with Weber explicit, especially the often delicate woodwind writing and the brass interjections, which are effective because of their rarity and brevity rather than their sheer force. But there are plenty of recordings out there that demonstrate that this orchestra can do force as well. In fact, the impressive track record of everybody involved here, the orchestra, choir, soloists, conductor and label, mean that the artistic success of this release should come as no surprise. It also means that future releases in the cycle are more or less guaranteed to be among the best of the many offerings in Wagner's anniversary year. At first appearances, this Khovanshchina isn't too bad. There are a number impressive voices in the cast. Everyone involved sounds very Russian, although in fact they are all Bulgarian. And the recording sounds clean and true, even 'modern' despite dating from 1978. But first appearances can be deceptive, and it soon becomes clear that this isn't an ideal Khovanshchina by any standards. It is a product of cold war politics in many respects. Western record companies, unable to work in Russia but still on the lookout for Russian sounding voices, saw countries like Bulgaria as the best compromise they were going to manage. What they found there were very old-fashioned performing traditions, competent and dependable, but nowhere near as exciting as what was then happening in the Western opera houses. 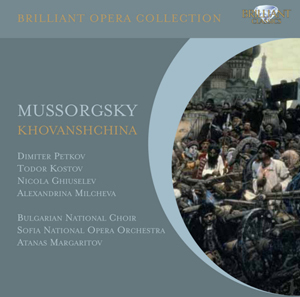 This is probably the last ever recording of Khovanshchina to use the Rimsky-Korsakov version rather than the more dynamic Shostakovich or Stravinsky versions. The conductor Atanas Margaritov seems comfortable with Rimsky's civilising influence, and gives a sweeping lush performance that is more in keeping with the editor's cosmopolitan view of the work than it is with the Mussorgsky's more brutal original conception. This, of all operas, should make you sit up. So a performance like this that you can easily put on as background music is obviously doing it little justice. But that said, the quality of the singing is one of the reasons why it is so easy on the ear. The three bass leads, Dimiter Petkov, Todor Kostov and Nicola Ghiuselev, all have the power, clarity and low notes required for their respective parts. Ghiuslev is the most profundo of them, and his passages in the lower register are a real treat. Good too is Alexandrina Milcheva as Marfa. She has a rich, lustrous tone and puts in plenty of vibrato. Comparisons with Ferrier are fitting, and demonstrate both the quality of her voice, and the old-fashioned style of her performance. The orchestra is impressively precise, but there is rarely much excitement or drama from them. Again, both Rimsky and Margaritov should share some of the blame for that. The distribution of the singers across the stereo array in this concert hall recording is impressive, perhaps a little more emphatic than in a modern recording, but not excessive. The balance between the singers and the orchestra is also finely judged. The cleanliness and roundness of the sound suggest that invasive noise reduction process were applied during the digital mastering. More annoyingly, there is a considerable amount of crackily interference in the right channel for much of the first CD. This was evidently already present on the recording's previous CD release, on Capriccio in 1996, so for once Brilliant Classics aren't to blame. Dubois' Concerto and Lalo's Symphony make an excellent pairing. Despite the greater fame the latter has achieved, the two works are of almost equal stature and are aesthetically very similar. Both are richly melodic, yet neither has tunes that are so memorable as to dominate the listening experience. And the balance of orchestra and soloist in the two works makes one almost the mirror image of the other, Dubois relegating the orchestra to a decidedly subservient position, while Lalo entitles his work a symphony, demonstrating that the ensemble is at least the equal of the soloist. Théodore Dubois' seems to have achieved too much in his lifetime for his posthumous reputation ever to catch up. He was a recipient of the Prix de Rome, organist at the Church of the Madeleine, director of the Paris Conservatoire and a member of the Institut de France. In an age that valued composers who were outsiders over those of the establishment, his official standing weighed against his many compositions, which continue to bear the brunt of his rival's petty jealousies. If this Violin Concerto is anything to go by, then modern audiences have been missing out on a great deal. The Concerto is traditionally structured, as may befit the work of an 'academic' composer, but the music it contains is anything but staid or conventional. Every corner of the violin's timbre and range are exploited, and the soloist is given a string of endlessly inventive melodies, which are supported by sumptuous and ever-changing textures from the orchestra. Most listeners are likely to come to this disc for the Lalo, but I suspect that most will enjoy the Dubois just as much. Frédéric Pelassy brings an ideally Gallic sensibility to both works. His tone is assertive, an important quality in both works, but always elegant. He is able to make the solo lines float while also giving a strong sense of rhythm through his definite articulations and controlled rubato. He has a fabulous viola-like richness to his lower register, which both composers exploit, and a focussed, precise sound in the upper reaches. The Slovak State Philharmonic Kosice are competent accompanists, although the orchestra rarely shines the way that Lalo in particular expects. Conductor Zbyněk Müller is more interested in precision than excitement, and so some of the orchestra's climaxes in the symphony don't quite reach the tumult you'll find on other recordings. But, barring a few ensemble problems between the woodwind soloists and the violin, the accuracy is commendable, and the balance between the orchestra and soloist, a tricky issue in both works, is finely judged. The sound quality does the soloist more favours than the orchestra. The violin always sounds immediate and clear, but the orchestral sound is more generalised and distant. It's not a big problem though, and even though Lalo calls his work a symphony, the soloist commands the listener's attention throughout both works. An interesting release then, and one that will hopefully introduce many new listeners to the work of Théodore Dubois. His concerto is what makes this CD worth buying. So too does the playing of Frédéric Pelassy, although the reserved playing from the orchestra prevents this version of the Symphony competing with the best versions on the market.